This new Hibben Claw offers pure gripping power! Constructed from one solid piece of 420 stainless steel for unique strength and durability, this unique claw knife features an unusual handle grip design that allows the knife to be held in two positions, plus thumb grooves for extra gripping power. Includes genuine leather sheath with stainless boot clip. 6" overall, 2 3/4" blade. I ordered several of these as gifts and a black one and a polished one for myself. This review is for the polished one. First, the sheath is very nice. The clip is very strong and quite tight, almost too tight to get over my belt, so that is good, because I know it will stay in place. However, the snap closure does not hold the knife securely in the sheath (no, it won't fall out). I can pull the knife from the sheath without unsnapping it, which could be a good thing if I need to deploy it in a hurry. Now, the knife...It is well made, and feels solid. The finger ring is ample enough for most anyones fingers. The polished blade was sharp enough out of the box to use as is. It is ergonomic and well balanced. The finish was well polished and smooth. Overall the blade conceals well and it was a good deal for the price I paid. Thank you. 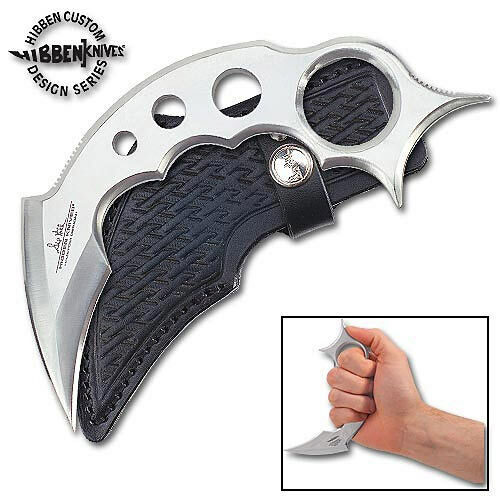 This is one of the better karambits available from BUDK. The curve/angle of many of the others are too shallow (almost hawkbills) and/or small (at least for my adult hand). Measurements: Outside Edge (convex) - 7cm. Inside Edge (concave) - 5.5cm. Rear Brake ~13cm. Front Brake ~10.5cm. Safety Ring Circumference (Inside) - 8cm. Thumb Rise ~3.5cm. Total Outside Length ~23cm. Thickness -3.5mm. Appreciate the extra holes to mount home made grips. The sheath is a nice leather with strong clip and fits with added grips. As you can see from the pictures the Inside Edge does not have much of a curve which makes it easier to sharpen I use whetstone, diamond steel and strop and go for about 25 degree angle/50 included. I AM TIRED OF SEEING PEOPLE COMPLAINING SHIPPED DULL, ETC.' FOLKS, IF YOU DON'T KNOW HOW TO SHARPEN/MAINTAIN A BLADE YOU SHOULD PROBABLY NOT OWN IT. Other notes: I don't know what a 'henadgrip design is' or what makes it unique. ALL karambits should be able to be held in two positions (blade 'up' or blade 'down'). I wish it was offered in a carbon steel, but the GH2028 is usable/workable. Nice looking but there is no edge on this blade. I couldn't cut toilet paper with this. I am very disappointed in this Gil hi been product. I would not recommend this. My very first purchase from TrueSwords, but most definitely won't be my last. I don't know where to start. Lol. This was an amazing buy. I love this knife. The sheathe is a snug fit. Its also very thick and sturdy. The knife is very solid. It came with a tip that was extremely shape and a pretty decent edge. This is officially my go to choice for a carry around defense piece. This knife is very good,meaning since my diabetes and neuropathy,I don't have feelings in my hands and 99 percent of the time I,have to look at what Im doing but don't get me wrong,this knife,holds well in my hand the cutting power is unbelief able,and the finger,hole keep it from slipping and making any cuts on my hand all I can say thank you and I recommend,this knife to anyone that's into the Karambit style. This karambit is AWESOME! It is ultra sharp, holds an edge well and is truly a work of art. Functional, yet classy. Carries well in custom leather case and you never know it's there. But, ready when you need it. God help the one at the end of this blade. And....a great piece for any collector at a fantastic price. This is a great buy. I have big hands as I am a pretty big guy, but it fits nicely and feels good in my grip. I doesnt come super sharp, but I fixed that on the inside curved blade and blunted the outer one to make it legal to carry. I dont leave home without it. My only complaint is that I wish the clip on the sheath was on the other side, so I could draw it straight up and have the reverse grip when its on my right side, but its all good. I love this Karambit. I have a few and really love them all, but this one has many options and is double edged - the only one I have found that is a reasonable price. It needs a little work to get the top edge sharp, but both pass the paper test. Fits well in my hand - I like reverse / traditional grip with these smaller ones. The Honshu Karambit fits and works for me better in a non traditional grip for slashing, but this is a perfect little blade. I love that I can keep it in the sheath and it can still be used for less than lethal strikes with the points on the handle end. SERIOUS WARNING HERE - if you like the non traditional grip (pinky in the hole) you really should file off the point at the base of the upper edge. There is a place to put the thumb, but I bet 99% of people will slide the thumb up and if you do this, you will slice your thumb wide open!!!! Just a word to the wise. This is just a beautiful little blade!! Buy it or a few! Again my thoughts on a horizontal sheath applies here as well. I purchased this knife to add to my other hibben knives. I carried it for a few weeks. I used it to cut feed bags open,, It was used on robe. bailling twine and roof paper.I am a very satisfied cusstomer. I like how it fits my hand to how it carries on my belt. I has since been cleaned and sits on the shelf with my other Hibben knives. Noe will buy a second knife to carry on me belt.